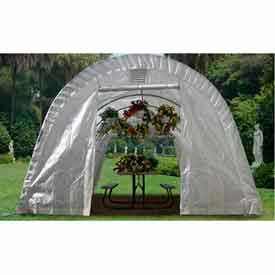 Translucent Instant Greenhouses Assemble Quickly For Easy Seasonal Setup. Translucent Instant Greenhouses are made from rip-stop fabric with UV-resistant and fire-retardant properties for long term use. Translucent covers promote early seed growth in spring and extend the growing season in fall. Greenhouses include galvanized, heavy duty frames that set up quickly without cutting, drilling or complicated tools. Anchors and hardware kit included. Raised Bed Greenhouses mount to any type of raised bed frame to protect young seedlings from early frost or animals. Traditional Peak Style Greenhouses provide instant growing space for multiple bedding plants and vegetables. Available in several sizes and styles. Translucent Greenhouses Provide Storage And Protection To Promote Growth Of Seedlings And Plants. Translucent Greenhouses are made with a fire-retardant, UV-resistant translucent polyethylene material for long lasting use. Zippered doors at either end allow for easy access and cross ventilation. 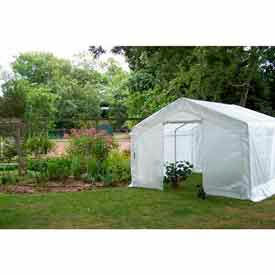 Some greenhouses include roll up side panels for increased air flow. Round Top or Peaked Top frame is made from maximum strength steel and features tool-free assembly with the included hardware. Includes anchors for securing greenhouse to ground. Available storage capacities range from 216 to 3120 cubic feet. Dimensions vary per model.